LAist gets a lot of event announcements, and we comb through them all to bring you a curated list of what’s happening in LA this weekend, including these 20 events. Don’t forget to check the March Guide, as it offers other options, too. We&apos;ll be back on Monday to help you plan the week ahead. FILM: UCLA’s Festival of Preservation continues this weekend with an eclectic lineup. Director Stanton Kaye’s Brandy in the Wilderness (1969) screens on Friday at 7:30 pm with the director in person. Saturday’s program includes: The Voting Rights Act of 1965 and the Hearst Newsreels at 3 pm, followed by early horror films White Zombie (1932) and Ouanga (1935) at 7:30 pm. Sunday’s screening features an afternoon double feature of early mad scientist flicks with The Crime of Doctor Crespi (1935) and The Drums of Jeopardy (1931). The weekend ends with Silent Fragments—snippets of films that no longer exist at 7 pm (live musical accompaniment with the screening). Tickets for each screening are $10 and take place at the Billy Wilder Theatre. SONGS FROM SKID ROW: Director Alina Skrzeszewska&apos;s has been making films about Skid Row for nearly a decade, and there’s a fundraiser for her latest film Game Girls on Friday from 7-11 pm in an event that includes, art, food, drinks, music and screenings. Her doc Songs From the Nickel screens in Indian Alley; These Days store and gallery exhibits the late Carl Ramsey&apos;s portrait series Women of Skid Row and other urban landscapes. The party benefits Game Girls, which documents the female experience on Skid Row. The benefit is free, but with a suggested donation of $20. EQUINOX MAGIC: The Lincoln Heights performance space HM157 presents the Ostara Fest on Friday night featuring “music, magic, mirth, and mystical delights in honor of the Vernal Equinox.” The event was named after the Goddess Ostara and features psychedelic music styles of The Warlocks, Magic Wands, Desert Magic and an Equinox ritual by Maja D’Aoust, the White Witch of Los Angeles. Other performances include modern dance by Mecca Vazie Andrews, comedy theater by Sarah Cisco’s Charm School, a spoonbending demonstration by Jenny Funkmeyer of Parallel University, visual projections by Major Gape, tarot readings by Tamar Lalenya and tunes by DJ Dan Mancini. Tickets: $15 at the door or $10 in advance. FLEA MARKET: The Artists & Fleas&apos; LA market returns on Saturday and Sunday (and every third weekend of the month) to the Arts District. The alternative marketplace brings together art, design, fashion, vintage items, music and food, including the trucks: Zugo , Falasophy, Amazebowls, Farmer&apos;s Belly and PerKup Coffee & Tea Co.. Guest DJ sets throughout the weekend, too. Free entry. The market is located at (647 Mateo Street DTLA). Hours: 11 am to 5 pm. COMEDY/THEATER: Loft Ensemble opens the comedy She Kills Monsters on Saturday at 8 pm. Written by Qui Nguyen, directed by Tiger Reel and with fight direction by Mike Mahaffey, the “high-octane comedy [is] fraught with hostile fairies, randy ogres, and &apos;90s pop culture.” Tickets are $20. Performances run on Saturdays and Sundays at through May 3. DUMPSTER ART: New York- and Rome-based artist C. Finley wallpapers dumpsters in DTLA as part of her latest art show, The Divine Distractions. 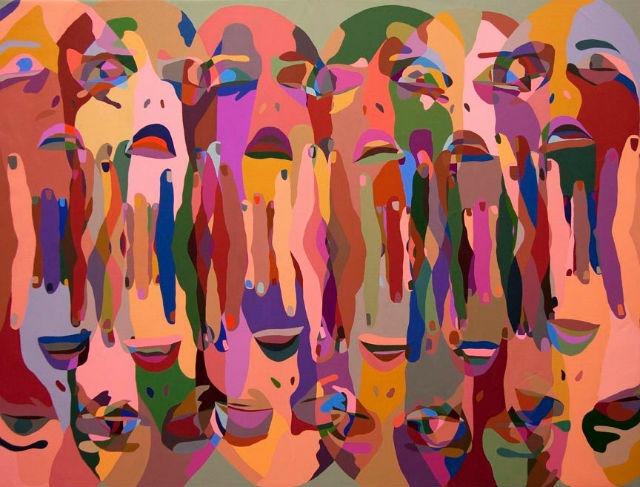 The project is an “inquiry into urban waste, free art, and notions of femininity, beauty and domesticity.” Her first L.A. solo exhibition at Superchief Gallery features large-scale paintings, too, with an opening reception at the gallery at 7 pm on Saturday. COMEDY/MAGIC: On Saturday at 7 pm, First Act has its first show at Nerdmelt. It’s a standup show created and hosted by AJ Tesler, who invites comedians to do jokes and bits from their first set lists. In the lineup for Saturday’s show: Dan Levy, Todd Glass, Daniel Kinno and Justin Willman, who’ll also perform some of his first magic tricks circa the 7th grade. Tickets: $8 with proceeds benefitting Rettsyndrome.org. BACH IN THE SUBWAYS: Bach in the Subways is a day-long event that celebrates the 330th birthday of German composer Johann Sebastian Bach with pop-up performances all throughout Los Angeles. Founded in New York by cellist Dale Henderson, the celebration has spread throughout the world. In L.A., highlights of the day’s events include a 10-hour Bach Marathon at Union Station, serving as the stage for chamber music performances by Enlightenment Music Series; the Sterling Flute Choir at the entrance gates of the L.A. Zoo; double bassist Frederick Charlton in the Central Library’s rotunda; Suzuki program cello students at the Glendale Metrolink platform; and solo strings and voice performances on Skid Row. A map of locations and full descriptions of all the performances for can be found at the Bach in the Subways website. DANCE MARATHON: The Hollywood Dance Marathon is a 6-hour dance party on Saturday night at Avalon Hollywood to raise money to fight pediatric cancer. Now in its 4th year, the official dancers raise a minimum of $300 to participate and dance nonstop while DJ&apos;s, bands, musical performers and dance groups also performs. General Admission ($30) and VIP tickets ($135) are on sale now. WRITEGIRL: WriteGirl, a nonprofit that empowers teen girls through creative writing, holds a reading of poetry and prose at Skylight Books on Saturday at 5 pm. WriteGirl’s latest anthology, You Are Here: The WriteGirl Journey, “showcases the stories of 161 women and girls navigating their way through small moments and big adventures.” It’s available for purchase at Skylight. BALLET: The American Contemporary Ballet launches into its fourth season this weekend with Dance + Design, which examines “the language of dance.” The program explores the classical choreography of George Balanchine and focuses on the female solo through dances from Raymonda Variations. The performances take place at Gensler in DTLA on Saturday, March 21 at 2 pm, 4 pm and 6 pm and on Sunday at 2 pm and 4 pm. Tickets: $30. STORYTELLING: Shades and Shadows, the storytelling series dedicated to dark fantasy, horror and science fiction, takes place at the Lyric Hyperion Theatre & Cafe on Saturday at 8 pm. Hosted by Lauren Candia and Xach Fromson, the evening brings together authors who read from their own works. On the program this weekend are: Leslie Ann Moore, Tiffany Tang, Christopher Allen Poe, Tracy L. Carbone, Robert Payne Cabeen and Del Howison. The evening will be recorded for Shades and Shadows’ inaugural podcast. Tickets: $8.50+ service fees. BOOK PARTY: Allan Amato has been photographing fine artists and then asking them to interpret his portraits through their own particular media. The collaborative works have been amassed in a new book Temple of Art, which is being released on Saturday during a reception and signing at 7 pm at La Luz de Jesus. Amato, along with many of the 50 collaborating artists, will be onhand to sign and discuss the book and the feature film that evolved from the project. 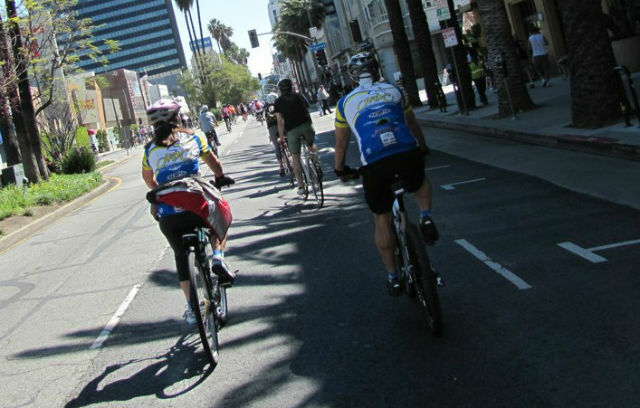 CICLAVIA: For the first time, CicLAvia heads over the hills and into The Valley on Sunday. Thousands of participants are expected to hit the road on bike, on feet and on skates between North Hollywood and Studio City, from 9 am to 4 pm. Some of the highlights include the North Hollywood Arts District, Universal City, the historic Campo de Cahuenga, Studio City Farmers Market and the Sportsmen’s Lodge. Free. VIRTUAL REALITY: Virtual Reality Los Angeles (VRLA) holds its first event of the year on Sunday in the Gold Ballroom of JW Marriott at LA Live in DTLA. The Spring Expo offers attendees an up-close look at the latest in virtual reality technology, such as Oculus Rift, Google Cardboard, Samsung GearVR. The event takes place from 1-7 pm, and general admission tickets are $20. CONSERVATION TALK: On Sunday afternoon at 3:30 pm, The L.A. Conservancy holds a panel discussion on preserving historic places with difficult histories. With a sometimes controversial history, Parker Center, which is currently scheduled for demolition, is being used as a case study. Panelists will offer various perspectives on the building’s significance and history. At the LAPD Police Administration Building, Ronald F. Deaton Civic Auditorium. Free. Reception follows the discussion. COMEDY FEST: The 3rd Annual Los Angeles Scripted Comedy Festival, hosted by iO West, runs from Sunday through March 28, offering L.A. the best in comedy. The weeklong festival features standup acts, sketch performances, video shorts and television pilots from performers across the country. In addition, the fest offers a number of great workshops and panels—including a Drunk History Panel on Sunday afternoon at 2 pm with show creator Derek Waters and cast and writers, who’ll give us a peek into the behind-the-scenes “of the booziest and funniest historical show ever made.” Most events are $10. VARIETY: Tongue & Groove, the monthly literary variety show at the Hotel Cafe, holds its first installment of 2015 on Sunday at 6 pm. Produced by Conrad Romo, this month’s guest readers include authors E. Amato, Lisa Douglass, Franki Elliot and Nathan Earl Rose. Music by Charlie Latan. Tickets: $7. MUSIC: Composer Max Richter, known for his minimalist and neo-classical music stylings, begins his U.S. tour at the El Rey Theatre on Sunday at 8 pm. He and the American Contemporary Music Ensemble will perform original music from HBO’s “The Leftovers,” and his critically acclaimed 2004 album, “The Blue Notebook,” which was featured in the Martin Scorcese film Shutter Island. Tickets start at $42.